Executive leadership is incredibly important in today’s environment. How can those of is in leadership contribute to and shape leaders who will ensure our institution’s mission and direction in the next generation? These sessions, drawing from insights learned from the highly selective White House Fellows program, help leaders learn how to harness and equip the unique strengths and abilities of rising leaders. Come and hear how your mentorship of the next generation can leave a legacy of influence at your institution for decades to come. 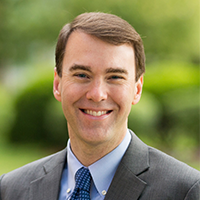 Award-winning sociologist and educator D. Michael Lindsay is the eighth president of Gordon College, and an expert on religion, culture and leadership. View from the Top, Dr. Lindsay’s most recent book, was released in May 2014. It reports the findings of his 10-year PLATINUM Study, the largest-ever interview-based study of senior organizational leaders—including former Presidents Carter and Bush, and hundreds of CEOs at the nation’s largest corporations and nonprofits. Lindsay’s Pulitzer-nominated Faith in the Halls of Power was listed in Publishers Weekly’s “Best Books of 2007.” His work has been profiled in hundreds of media outlets worldwide, and his research has been funded through fellowships awarded by the American Council of Learned Societies, the National Academy of Education and the National Science Foundation. Since his appointment to president of Gordon College in Massachusetts in 2011, Gordon has experienced banner years in terms of enrollment, fundraising, financial strength, campus diversity, sponsored research, athletic success and faith expression on campus. President Lindsay is gratified to be working alongside talented colleagues and regards the College’s gains during his tenure as evidence of a winning team. He also serves on the boards of Christianity Today and the Veritas Forum. From 2006 until 2011 Lindsay was a member of the faculty at Rice University.